The Motor Boats Monthly cruise in company to the Netherlands has successfully stayed ahead of unseasonable bad weather to reach Ijmuiden on the North Sea coast and the relative sanctity of the inland waters beyond (19 August 2004). 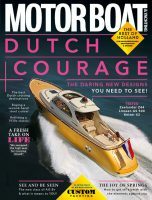 The 28 boats of the Motor Boats Monthly cruise in company to the Netherlands have reached the attractive city of Dordrecht at the crossroads of some of Europe’s busiest waterways (22 August 2004). The 28 boats of the MBM cruise in company to the Netherlands are filling to capacity the town basin of the Delta port of Goes (25 August 2004). The closing acts of the Motor Boats Monthly cruise in company season have provided a graphic illustration of the way in which modern, fast motor cruisers can exploit weather windows (30 August 2004).